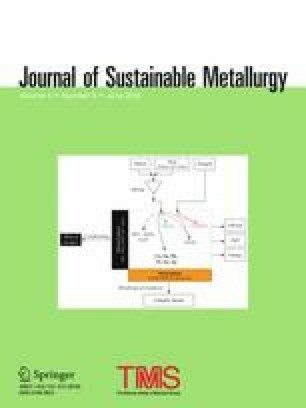 This paper presents the results of theoretical assessment and a preliminary experimental investigation of the modified pyrometallurgical processing of metallic granulate obtained after mechanical treatment of waste printed circuit boards (WPCBs). The studied two-step process included oxidation of metallic granulate followed by pyrometallurgical refining in a DC arc-furnace. In the investigated process, the oxygen bounded in metal oxides, obtained during the oxidation annealing of granulate, was used as a “solid” oxidizer for subsequent pyrometallurgical refining in a DC arc-furnace. According to the obtained results, the Cu content in the produced metallic phase (anodic copper) was 98.4% and is suitable for further electro-refining process. In addition, over 94% of Au was concentrated in metallic phase, suggesting that a high Au yield could be attained. However, owing to the distribution between slag phase and filter product, only 60% of Ag was collected in the metal phase. In-between metal and slag is the metal-oxide phase, containing Cu with metals impurities, such as Sn and Pb, which was obtained as well, and could be further treated using conventional processes for additional metal valorization. The investigated concept would allow substitution of the long-lasting oxygen blowing process and application of complicated pyrometallurgical reactors and create a feasible alternative for lower operating capacities. The contributing editor for this article was Bernd Friedrich. The presented research was supported by Ministry of Education, Science and Technological Development, Republic of Serbia, project “Innovative synergy of by-products, waste minimization and cleaner production in metallurgy,” No. TR34033.